2.add sample：Set blank wells separay （blank comparison wells don’t add sample and HRP-Conjugate reagent, other each step operation is same）. testing sample well. 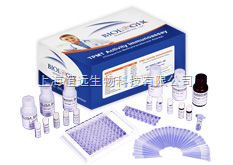 add Sample dilution 40μl to testing sample well, then add testing sample 10μl （sample final dilution is 5-fold）, add sample to wells , don’t touch the well wall as far as possible, and Gently mix. 4.Configurate liquid: 30-fold wash solution diluted 30-fold （or 20-fold） with distilled water and reserve. 10.Stop the reaction：Add Stop Solution50μl to each well, Stop the reaction（the blue color change to yellow color）. 11.assay：take blank well as zero , Read absorbance at 450nm after Adding Stop Solution and within 15min.